CHICAGO, February 6, 2019 – With a growing presence in its home city of Chicago, Kudos is venturing beyond the Midwest by partnering with The Lost Dutchman Marathon in Apache Junction, Arizona. 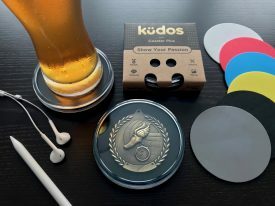 As part of the agreement, Kudos will offer its patent-pending medal-display kit to select finishers looking to celebrate their accomplishment on race day, Sunday, February 17. The Kudos Coaster is a do-it-yourself coaster and kit designed to display race medals. Users place their medal of choice inside the coaster and can switch it out with others at their convenience. More compact and less expensive than wall-mounted frames, the product combines form and function to securely fit most medal shapes and sizes, and can also be used to display race photos or other cherished keepsake items. The Lost Dutchman Marathon was voted Best Marathon of the Valley 2018 by Phoenix Magazine. Held every Presidents Day weekend, the marathon is run at the base of Superstition Mountain near the rumored site of the legendary Lost Dutchman Mine. The event features a pre-race campfire and includes a 2 Mile Fun Run/Walk, 8K Trail Run, 10K and Half Marathon in addition to the USATF-certified marathon. Register at www.lostdutchmanmarathon.org. The Kudos Coaster was created as a better way to store and feature race medals. Over the last six years, DeBoer developed the product into its current form which includes a clear, removable acrylic top and a polyurethane base providing stability and grip. Colored Tru-Fit inserts allow users to pick a backdrop that complements their medal, and the inserts can be removed to accommodate medals of varying thicknesses. Kudos, a registered trademark of RLRD, LLC, helps people share, preserve and display their memorable accomplishments with pride. The company approaches old things in new ways by producing inexpensive, quality-built products that combine form and function. For more visit www.kudos2u.com.